It is fitting in this season of giving that the poker playing community can show its soft side! A fine example can be found in the greyhound racing community which has arranged a poker tournament to raise funds for some of the UK's unsung animal charities, including The Greyhound Retirement Trust. The Greyhound Poker Classic is a poker tournament being held on this coming Sunday, 17th December, at Harlow Greyhound Stadium, Harlow, Essex, It is open to anyone connected to greyhound racing in some form, including greyhound trainers, owners, kennel staff, and also to members of the Harlow Poker Club. There will also be a free buffet on hand. The event, which is sponsored by Imperial Kennels (the Suffolk base of champion greyhound trainers Mark Wallis and Linda Jones who train dogs for racing at Walthamstow Stadium in East London) is a £30 buy-in plus the option of one re-buy and one add-on. 10% of the total prize fund is "earmarked" for a donation to various charities involved in the care and homing of retired greyhounds. 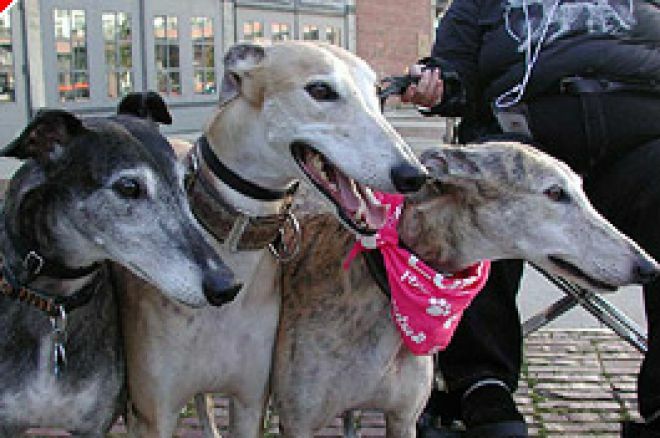 The major charity in this field is The Greyhound Retirement Trust which has for over 30 years used volunteers to find loving homes for greyhounds whose racing careers are over. To date, the charity has homed around 35,000 greyhounds after rescuing them from uncertain futures after their racing days. According to the GRT, approximately 9,000 greyhounds retire from racing each year, typically at between three and four years of age, but some even younger, perhaps through injury or a shortfall in ability. That means they have well over a decade of potential life remaining yet many owners are interested in them only for their racing potential. A great many owners will adopt greyhounds into their homes or arrange for them to live out their retirement at a kennel and the GRT works hard to encourage owners to take their responsibility for their dogs seriously, but it also encourages the public to consider taking on retired greyhounds. - "lazy couch potatoes needing only two twenty minute walks a day." - "when re-homed responsibly, they can live in harmony with other pets." - "totally addictive - once you've owned a greyhound you'll never be without one!" Congratulations to the poker community on this initiative. For those interested in playing (assuming you have some connection with greyhounds), you can call Harlow Stadium on 01279 639248. Doors open at 5.00pm on 17th December, registration by 5.30pm, and the tournament kicks off at 6pm.